With a budget buster from Onkyo, MusicCast multiroom from Yamaha and a best in class Arcam flagship, there's an AV receiver for everyone here. Can't be arsed with all that AV wiring? While few AV receivers are likely to win beauty prizes, these bulky home cinema boxes pack in an awful lot of functionality. They are full-on home entertainment hubs. Any AVR worth its salt will support Bluetooth, and the majority will also have Wi-Fi onboard. Integrated music services, like Spotify, Tidal and Deezer are standard attractions, along with Apple Airplay and increasingly Chromecast built-in. These days, all bar a few budget models support Dolby Atmos 3D audio. Atmos, for the uninitiated, is a scalable object-based sound system available with seven channels of amplification, in a 5.1.2 (five surround channels, one subwoofer output and two height channels) speaker configuration. This rises to nine or even eleven channels, for 5.1.4 or greater. One key aspect to note when shopping is the number of HDMIs provided, both inputs and outputs, and their 4K compatibility. One HDMI output to your TV may seem fine, but if you want to add a projector to your setup, a second HDMI becomes indispensable. Now dim the house lights and read on for our guide to the five best AV receivers you can buy today at various price points. If you don’t have the space or budget to accommodate Dolby Atmos upfiring speakers, a budget 5.1 receiver is your best bet. And this is the best bet in that particular horse race. Onkyo’s TX-SR373 comes with a matinee ticket price, but is 4K ready and ideal for gaming, box-set binging and movie nights. You get four HDMI inputs, and can stream music to it from your smartphone over Bluetooth, giving tunes an upscaling tickle with Onkyo’s DSP Advanced Music Optimiser. Setup is aided by AccuEQ Room Calibration, which is unusual at this price point. The receiver decodes both DTS-HD Master Audio and Dolby TrueHD formats, and has a 135W per channel power plant. Proof you don’t need to dig deep to deeply annoy the neighbours. AV receivers may have a deserved reputation for bulk, but it is possible to have a home 'thinema', if you will. Thanks, I'm here all week. The NR1607 is the latest iteration of the Marantz slimline AVR range, and stands just 105mm tall. Despite the lack of stature, there’s no compromise on features: this good looker packs in seven channels of 50w amplification, Dolby Atmos and DTS:X decoding, the latest HDMI input spec, plus hi-res audio playback, including DSD. Set up is aided by Audyssey room correction. All seven rear HDMI inputs support 4K with HDCP 2.2, so there’s ample opportunity for hardware hook-ups. Integrated Wi-Fi and Bluetooth are also provided. Despite that meager sounding 7x 50w spec, the amp’s performance is energetic, with snappy multichannel steerage and enormous clarity. The NR1607 is also surprisingly nimble with two channel music. If you have a relatively modest home cinema space to fill, this is a must-try. Yamaha’s versatile mid-range Dolby Atmos 4K AV receiver should suit most room sizes, and it sounds terrific. A seven channel design, it decodes both Dolby Atmos and DTS:X, and supports Yamaha's MusicCast wireless multi-room audio system. The RX-860 is big and beautiful (well, sort of), with excellent build quality. There are seven rear HDMI inputs, although only three of support 4K HDCP 2.2 sources. On the plus side you get twin outputs, handy if you want to feed both a telly and a projector. You can network and stream over ethernet or Wi-Fi, and there's also Bluetooth Apt-X. The AVR is rated at 100 watts per channel, and has a wonderfully dynamic attack. It’s also fabulously fluid with high-res audio. File compatibility includes 24-bit 192kHz FLAC and DSD. Additional niceties: Yamaha’s clever YPAO room calibration system, and a variety of Cinema DSP modes. Silent Cinema (aka virtual surround) works with any wired headsets, and is well worth checking out. Offering nine channels of amplification, this beefy Denon allows you to run either a 5.1.4 or 7.1.2 layout – and there’s processing for a full 11 channels (7.1.4) if you have space for additional amplification. It handles both Dolby Atmos and DTS X decoding, and can even be upgraded to Auro 3D, although with next to nothing compatible, you have to think of it as, at best, possible future-proofing. There’s Wi-Fi plus Bluetooth, naturally, while auto calibration comes via Audyssey’s top rated and hard-to-spell MultEQ XT32 system. Rated at 9x 200w, this Denon really does have massive power. Multichannel imaging and transient delivery are superb. Blockbusters play with room shaking power, but it does the quiet atmospheric stuff well too. High-res audio file support covers 24-bit/192kHz WAV and FLAC, as well as DSD. The receiver is HEOS multi-room enabled, which means it will integrate with a larger HEOS whole home audio system. You can even play a CD, select that input as the source on the AVR through the HEOS app, and then 'Party Zone' – woo! – the music through to any connected HEOS speaker. Design and connectivity are also properly premium. The X4300H has a copper plated chassis and mono block construction, with seven rear HDMI inputs, all of which support 4K HDCP 2.2. There are also three HDMI outputs, which means you can feed both a flatscreen and projector in one room, while routing the third HDMI to… something else. Arcam offers a different take on high-end AV: treating you mean to keep you keen. There are few fripperies here: no Wi-Fi or Bluetooth, not even Apple AirPlay, the high-res support doesn’t include DSD and the AVR850 is 'only' a seven-channel design, which translates to a 5.1.2 Dolby Atmos layout. However, the payback for your restraint in terms of modern features is glorious cinema surround and stereo. Key to its success is Dirac Live, a supremely sophisticated auto calibration system. If you want your listening room to sound like a studio mastering suite, EQing it with Dirac Live is probably the best way to go about it. All seven rear-placed HDMI inputs support 4K with HDCP 2.2, and there are three HDMI outputs. 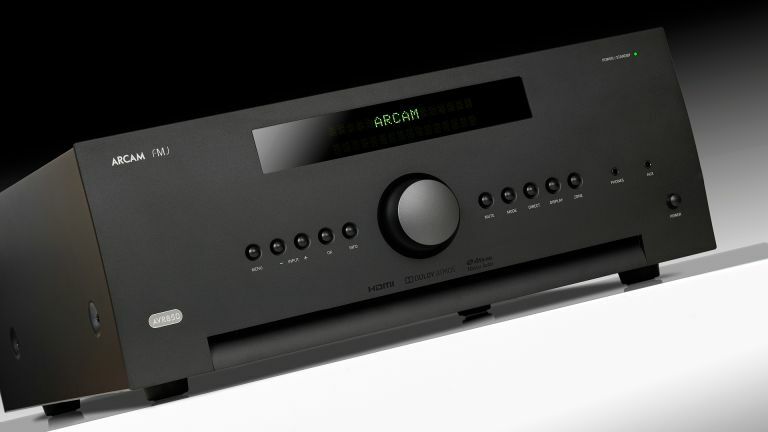 The AVR uses Arcam Class G power amplification, rated at 100W per channel, to deliver the goods. Spatial placement and dynamic attack are hugely impressive. Once finely tuned by Dirac, the receiver is taut and effective with every source. This is Arcam’s best sounding AV receiver to date, in short, and well worth a purchase, if you have the readies.